We're dedicated to providing affordable, targeted marketing that helps your potential customers find your business online quickly and easily. Organic placement on Google means that you’ll show up anywhere on the first page of Google and not only in the small Local Section. Organic Rankings give your listing the placement that it needs to succeed and that’s the direction that Internet Local Listings is branching out in. 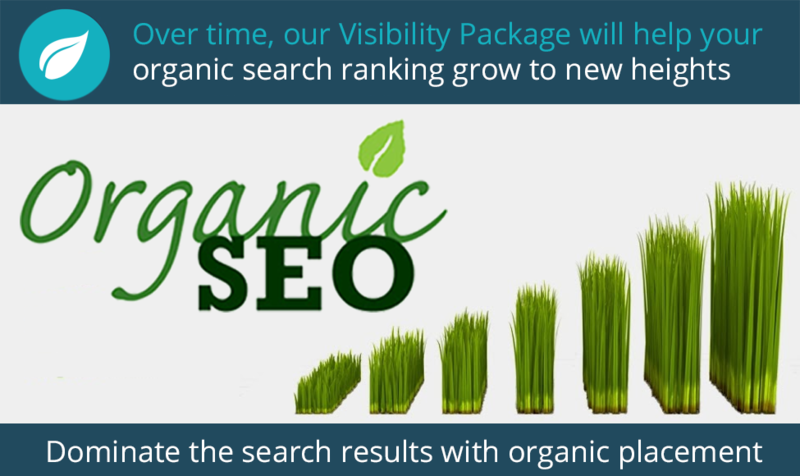 It also allows your business to utilize a separate selection of keywords that isn’t specific to local placement and with the products and services that we provide, you’ll achieve front page local organic placement. Whether your businesses Facebook, Twitter or Custom YouTube channel is found on the front page, you’ll cover more bases with these customer engaging services.The more activity that Search Engine’s see, the better your business looks like to web crawlers that work to identify the keywords attached to your many business listings. Once these keywords are identified, they’re delivered to the front page so your business listings will pop up there when those keywords are searched – That’s the benefit of Organic! 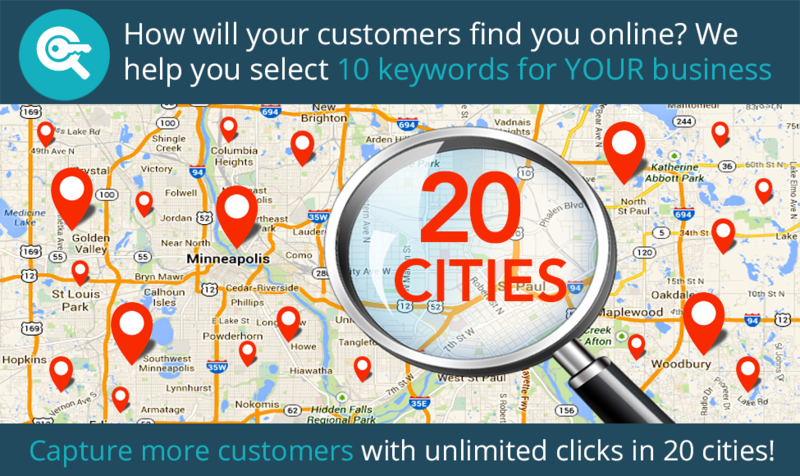 With 10 unique keywords spanning over 20 cities, your business will stand out where it matters most. Tell us about your key demographics and areas that you’d like to target and we’ll get your business listing found by more than just the city your business is located in.During your initial consultation with a member of our Provisioning Department, you’ll decide which keywords are best for your business. The goal is to select keywords that your potential customers are searching for in your geographic location.Need some help deciding which keywords work best? That’s what the experts at Internet Local Listings are for. Through years of working with over 90 different industries all across the United States and Canada, our database of keywords is enriched with all of the keywords and phrases that will get your business the most online visibility.After working with your Provisioning Representative to select five keywords, we will do a little more work on the back end to select five more keywords that offer your ten fully optimized keywords that will bring your business listing to the top of Google’s Search Pages when searched for. Want to be found in more cities? Check out our Visibility and Apex plans or add cities to your package starting at just $40 a city. As part of our Apex Package, we offer you an exclusive Premium Website as a part of your marketing campaign – meaning that our $499.99 value is provided to you at no additional cost. This Premium Website offers all of the background SEO enhancements provided in the Branded Website with all of the customizable aesthetic enhancements that you want to represent your business over a span of 15 attention grabbing pages.Each website that we created is constructed with your industry and your wants in mind. 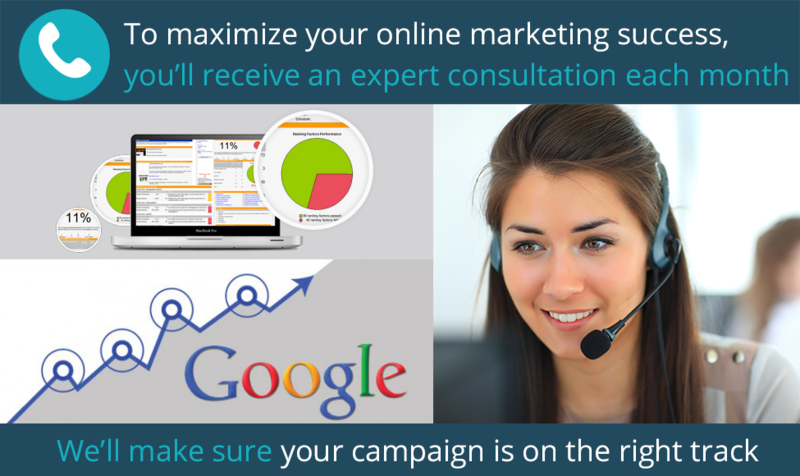 Our industry experts advocate the best verbiage and aesthetics to drive customers to your site. 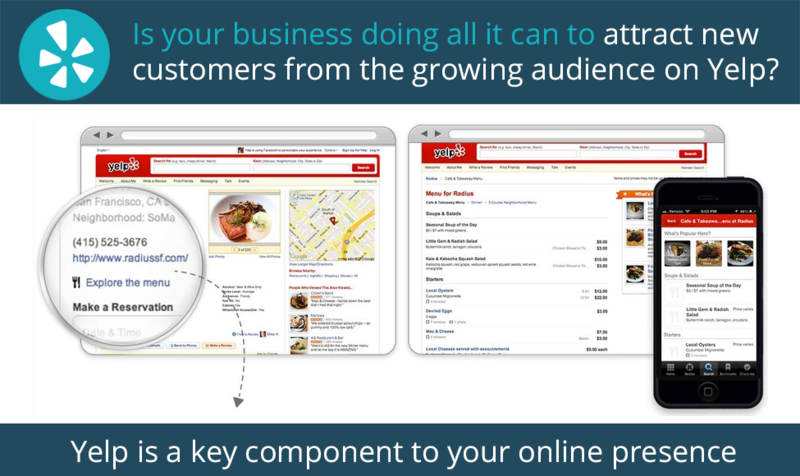 Your Website will enable your customers to contact you, view photos, read more about your business, find out about your offered services and more.By making a unique and professional first impression, your business will stand out to even more potential customers. 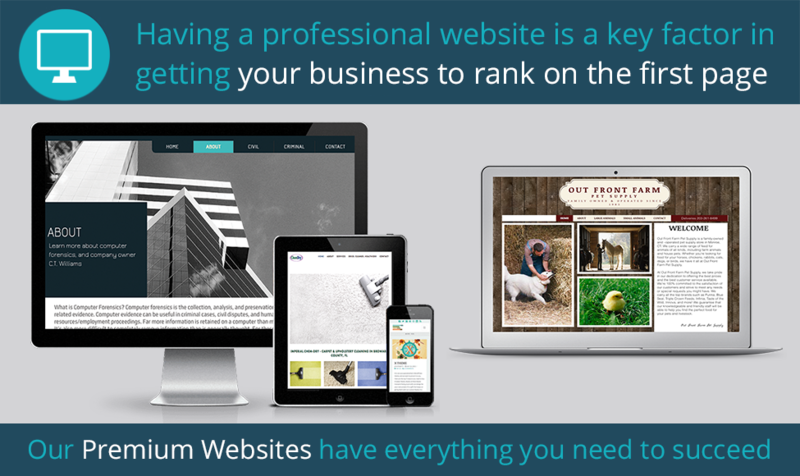 Already have your own website and don’t want to use a Premium Website? No problem! 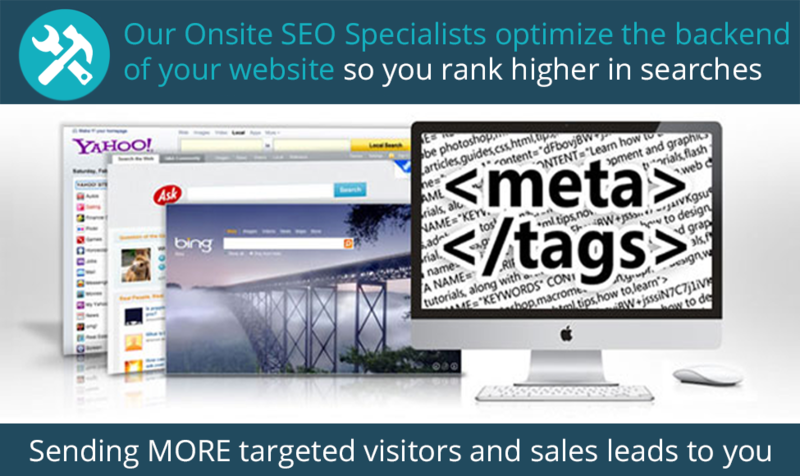 As an Apex Client, you also have the option for an On Site SEO Scrub! Check out the tab below. Add Social Sharing Capabilities - Your website will get even more traffic after being shared through social media by your customers and potential customers. Image Optimization - We will change alt tags to completely optimize the images on your website. Generate an XML Sitemap - Simply stated, an XML Sitemap is a document that helps Google and other major search engines better understand your website while crawling it. We'll also submit this Sitemap to Google via Webmaster tools. Titles & Meta Elements - We may make slight content changes to Headers and metatags to ensure that they're attracting web crawlers. Welcome Web Crawlers! - We'll change things behind the scenes to ensure that web crawlers can easily slide through your website coding and find all of the information they need to help your website succeed on the front page. Target Your Searchers - We'll make sure your website coding has what it takes to target your searchers; making sure your coding has all of the information that your potential customers might be searching for. Balanced Keyword Targeting - We'll bold keywords and use them in meta tags, alt tags, meta descriptions and more to enhance the usability of your keywords and your user experience. Internal Links - We'll use your content to create internal links that keep your customers on your site for longer periods of time to possibly increase the amount of customers that use your business after finding your website. 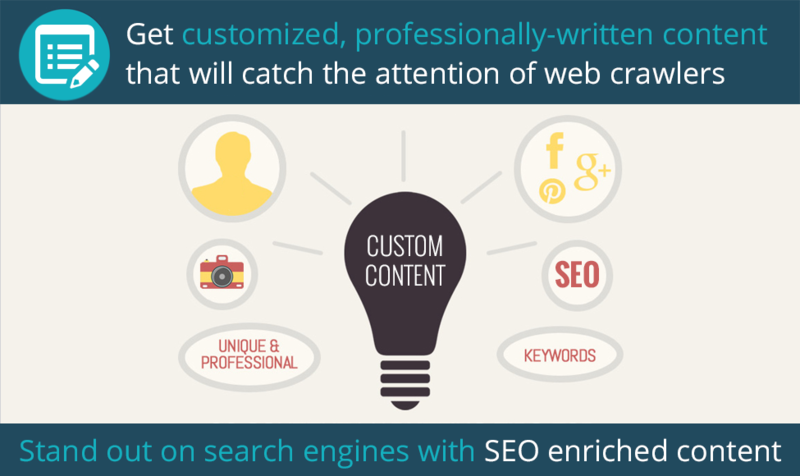 All of these features will benefit your business by exposing the best possible SEO enhancements to your website. When it comes down to it, content is king! Keeping up with industry trends and the latest Google Pigeon update, we’ve realized that content is more important now than ever. If your business listing doesn’t have SEO enriched content that uses the right keywords, tones and calls to action, it won’t catch much attention from Google, other Search Engines or your potential customers. That’s why we put so much effort into creating flawless content that is customized completely for your business.After getting some information from you and doing some extra research on your business, our expert staff of writers will put the pen to the paper to provide your business listing with successful content that is web crawler and potential customer friendly: inviting Google and customers to check out your business and want to learn more.This content will saturate the pages of your Branded or Premium Website and be connected to all of your online business listings and directories in order to gain maximum online exposure.Can’t get enough? This custom content is also provided with all three of our website options! We start by creating a Google My Business profile for your business and are able to display all of your information in one location – making it simple for your potential customers to see your business online, locate your phone number and contact you with the push of a button.After verifying that your business is compliant with Google’s search terms, you’ll see your listing online in as little as 72 hours and from there, the work toward finding it on the front page continues. 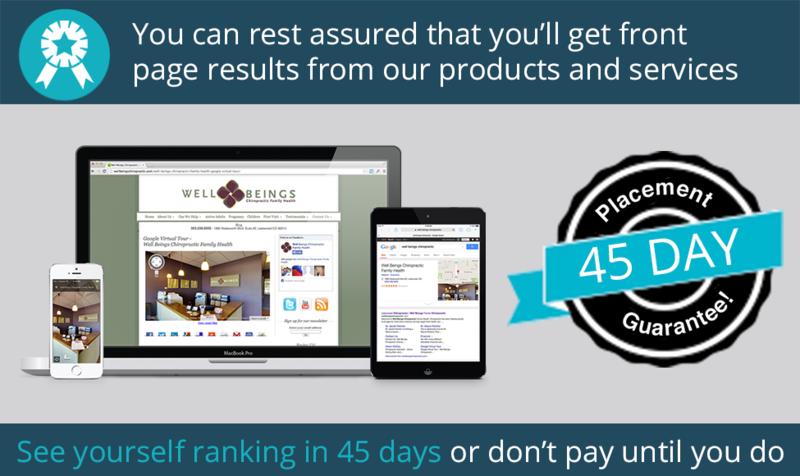 Our goal is for you and your potential customers to see your business on the front page of Google before our 45 day guarantee. The sooner, the better – right? That’s what we think and that’s why we offer several other products and services in culmination with your Google My Business profile.Need more of a reason to trust Internet Local Listings with your online marketing campaign? Check out our other services and products. It is true that a majority of the population uses Google to search for local business but what about the number of people that actively use Yahoo! instead of Google? Think about it – if 1,000 people search for services or products from a business like yours and only 80% of them use Google, 200 of them won’t see your business if it’s not listed on Yahoo! 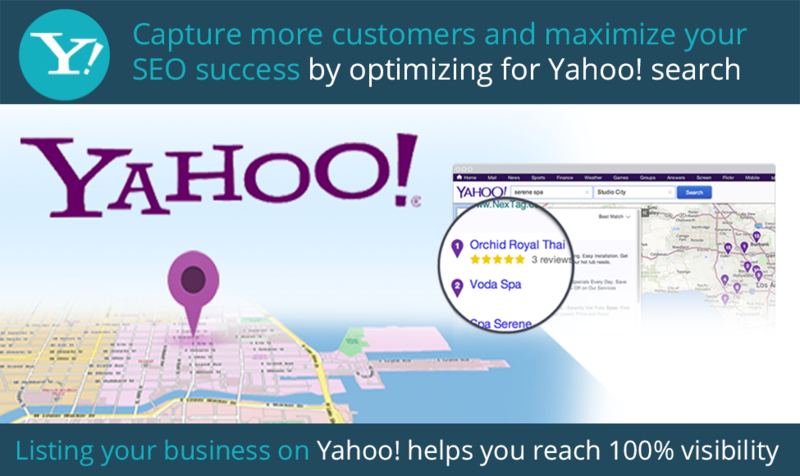 That’s 200 potential clients that won’t be targeted by your internet marketing campaign if Yahoo! is missing from it. Yahoo! is used by a majority of women as the sites look and feel appeals more to the gender making it a great way to reach out to women and men who rely on Yahoo!’s Search Engine Results Page. This Search Engine, in conjunction with Google and Bing, will bring you 100% visibility across the internet’s three major Search Engines and offer an entirely new potential customer base.So think about it… What do 200 potential clients mean to you? It is true that a majority of the population uses Google to search for local business but what about the number of people that actively use Bing instead of Google? 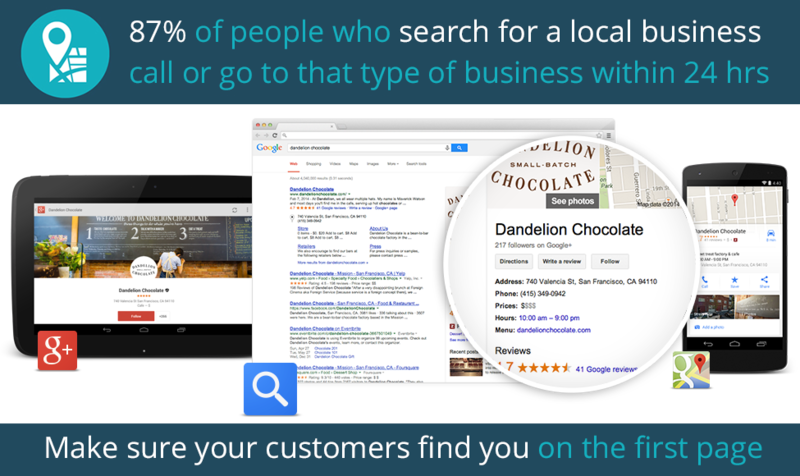 Think about it – if 1,000 people search for services or products from a business like yours and only 80% of them use Google, 200 of them won’t see your business if it’s not listed on Bing! 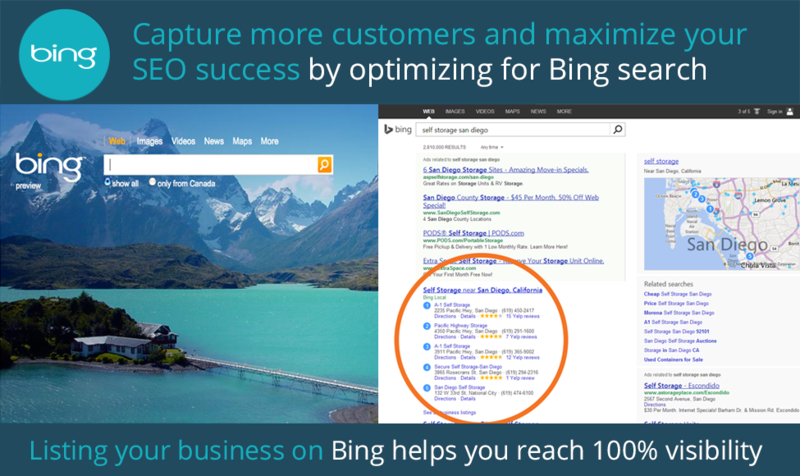 That’s 200 potential clients that won’t be targeted by your internet marketing campaign if Bing is missing from it. Bing is used by a majority of PC users as it’s owned by Microsoft and set as the default homepage for Internet browsers in all PCs. How many people do you know that use a PC? Not think about the number of people you know that actively use Bing as their default brower. This Search Engine, in conjunction with Google and Yahoo!, will bring you 100% visibility across the internet’s three major Search Engines and offer an entirely new potential customer base.So think about it… What do 200 potential clients mean to you? Being listed in Google, Yahoo! and Bing is great! But it’s not all that your business needs to be found on the front page. Through all of Google’s changing algorithms, one thing has remained the same: the more places your business is found across the internet, the more reliable it is for Google and other Search Engines.If your business listing is seen across several online directories with consistent information, Search Engines are more easily able to recognize the keywords associated with your business and will start to move your listing up to the front page.The best part? Even though Google is the most searched Search Engine, some people prefer searching for businesses in online directories so you’ll be reaching to an even broader audience with each of these listings! Like what you’ve seen so far? GREAT! One more thing to keep in mind about all of the online products and services that you see here – Every one of them is optimized for mobile performance. 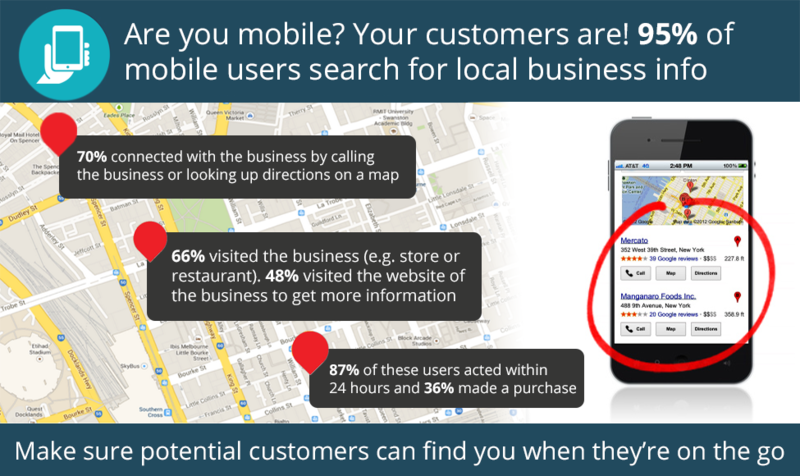 This means that even if your potential customers are on-the-go, they’ll be able to search for business like yours and your business could show up according to the geolocation of your potential customer.Another great benefit? Once your potential customers find your business, they’ll be able to contact you directly through their smartphone by simply clicking on your phone number. They will also be able to get directions from their exact location to your business – the convenience of this will entice people to go to your business right away. Videos are a great way to grab the attention of people browsing the internet. A thoroughly optimized 30 second video will display photos unique to your business and the keywords that you’ve chosen to target your audience accompanied by music that fits the rhythm of the video. 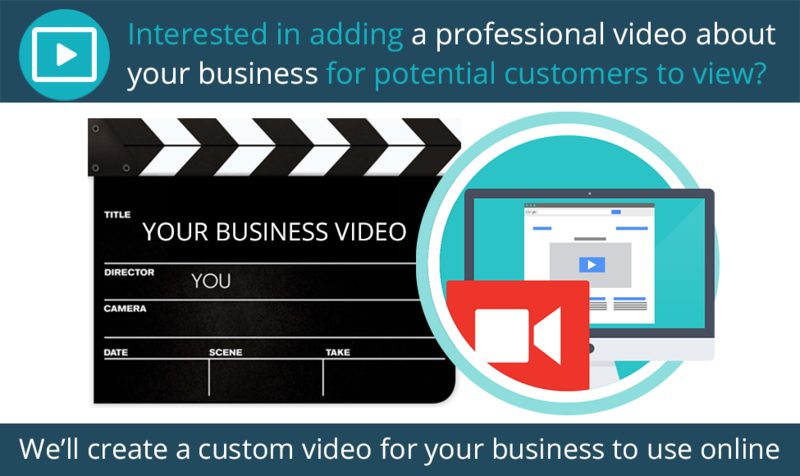 These eye-catching videos will be displayed on your Branded Website and will offer another part of the multifaceted experience that your potential customers will find on the front page of Google and other Search Engines. Think about all of the people that you know… Now ask yourself how many of them have a Facebook or Twitter profile? Or both?! 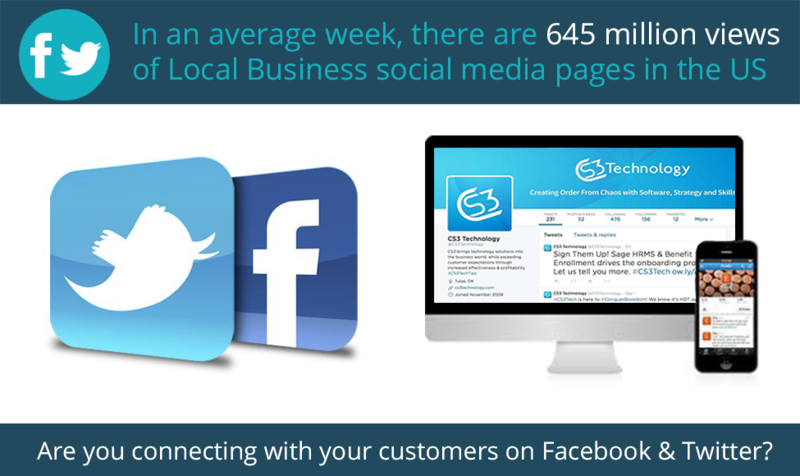 Over 1.6 billion active users are engaged in their Facebook and Twitter profiles each month and nearly all of them follow a local business to stay connected with the business and keep up to date with any new business offers or changes.We utilize your Facebook and Twitter page in the most effective way possible: engaging your followers with several posts a week. These posts can be customized with information that you want to include in them or we can do the work for you. Customer engagement is one of the most important aspects of your business and we want to help engage your customers online while you engage with them face to face. Since we’ve already set up your Google My Business Profile, we’ll dive even further into your internet marketing campaign and create another Google profile for you: Google+! 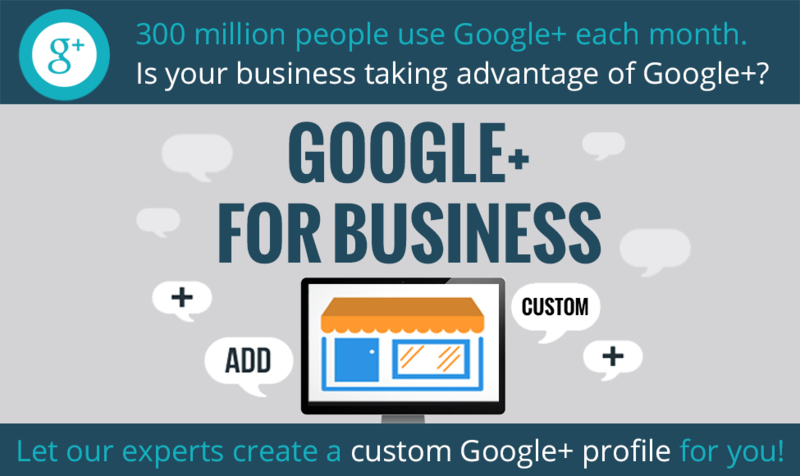 Having your very own, customizable Google+ Profile for your business is one of the most important tools that we can provide you with. Our goal is to get your business listed on the front page of Google and with a listing in Google’s very own Social Media platform you’ll be able to reach even more potential customers online with ease. Yelp is one of the largest review based profiles and is used by 139 million visitors monthly. With over 86,000 business listings on Yelp, it’s important to make sure that your business is listed among your competitors so that your potential customers don’t miss out on all that your business has to offer. What’s even better? Having a business listing in Yelp makes it easier for you to be found on the front page of Google as well as in a Yelp search – so no matter where your potential customers are looking, you can be found!Reviews play a major role in a potential client’s deciding factor when selecting which business to trust and that’s why Yelp is even more beneficial. With active users leaving reviews on Yelp daily, you’ll have the opportunity to ask your customers to leave a review that will make your business stand out amongst the rest! You know the timeless saying, “a picture is worth a thousand words”? Pictures are worth even more these days because of the impact that Social Media has in the ways of Facebook, Twitter and, most recently, Pinterest. 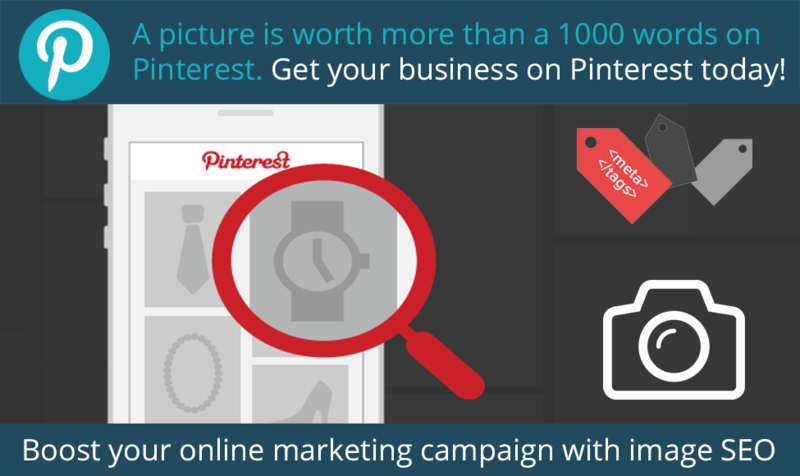 As an integral part of the Social Media campaigns that you’ll receive with your Visibility Package, your business will be fully equipped with a Pinterest account that will “pin” and post photos related to your business and industry. This will provide your business with an even greater online presence that will get you more attention from potential customers and the people that are interested in what your business and industry have to offer. 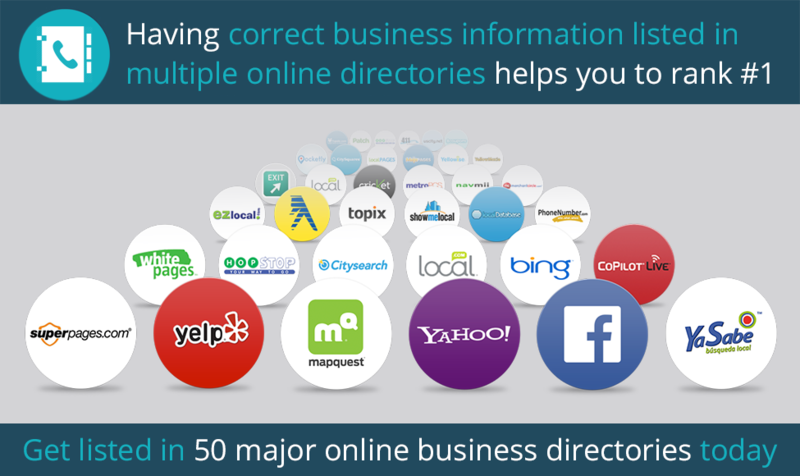 The internet offers a wide variety of directories for your business information to be listed in and with a premium vertical directory listing, you’ll have your business listed in a directory that is specifically tailored to your industry. 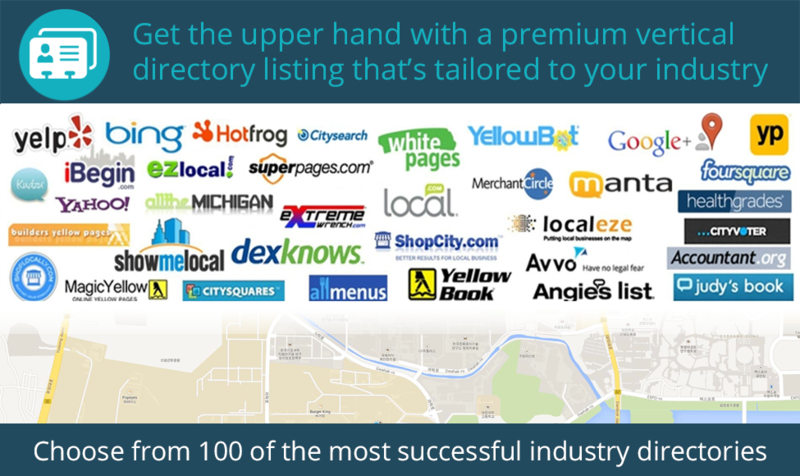 We’ve performed extensive research and developed a list of over 100 of the Internet’s most successful industry-specific directories according to geolocation – meaning that we’ll put your business in the best Online Directory possible for your industry in your location. This listing will give you the upper hand by placing you Online in a place that potential customers looking for your type of business will rely on!Interested in which Premium Vertical Directory listing would be best for your business? Email us at support@internetlocallistings.com and an account executive will respond and let you know. 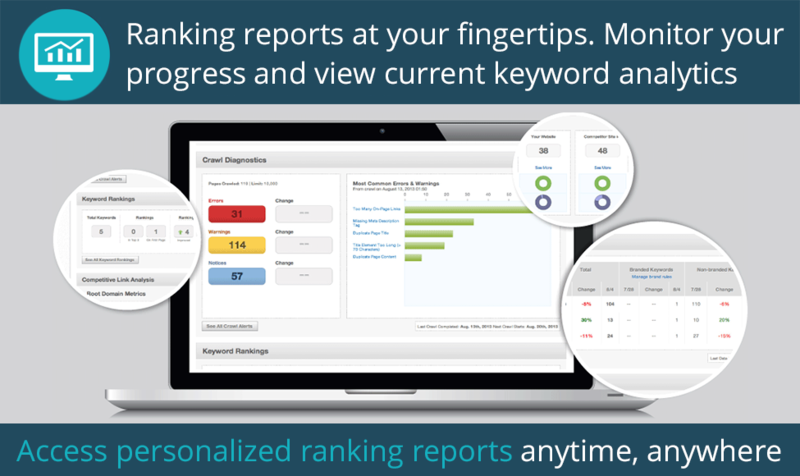 Our client portal offers access to your ranking reports whenever you want to see them. By simply logging in, you can check on the status of your online listing whenever you feel like it – it even tracks the movement of your business listing through 100 pages of Google Search Results so you know where your listing is at and where it’s headed. 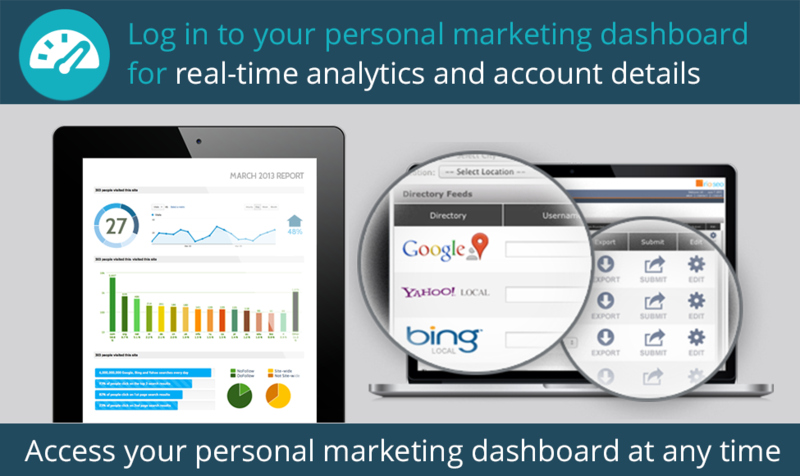 With analytics about how your keywords are doing, how often your business listing is found in online searches and what pages your business can be found on from a day-to-day basis, we are able to provide services that are custom tailored to the success of your online marketing campaign.Have any questions about your client portal? No problem! Call or email us any time and we’ll be happy to walk you through everything you see. In order to ensure that your directory listings are 100% accurate across all pages, we use unique software that submits your business information to online business directories quickly and updates them within four hours of being entered. 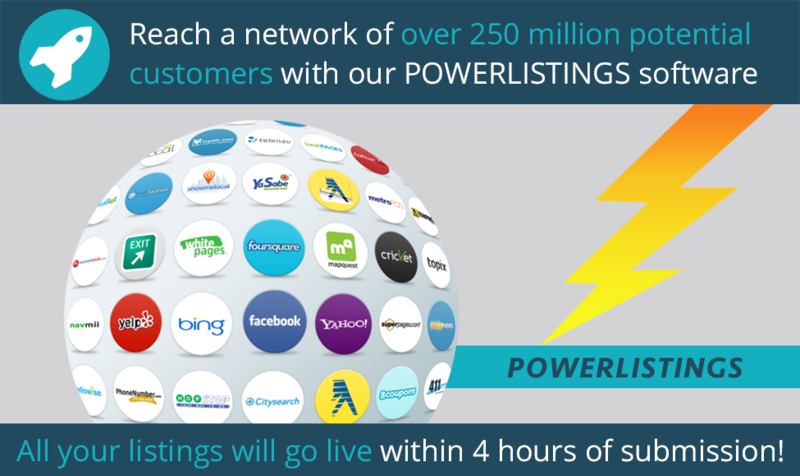 This means that your business listings will be live and ready to view almost immediately!Want to check on the PowerListings for your business? Visit our homepage and fill out the fields – if you’re a client of Internet Local Listings, you’ll see your listing powered up. If you’re not a client and would like to see accurate listings for your business listing, contact us and we’ll discuss your marketing campaign. We think that it’s best to be as transparent with our clients as possible for the duration of your internet marketing campaign and we’re proud to offer our very own client platform that you’ll have access to 24/7.By simply logging in, you’ll see all of your keywords and the progress that they’re making on the front page of Google with ease. The dashboard maintains all of the information about your account from the day we set it up so you can see the progress over the months that you are with us.Everything you need to see in one place! The day you sign up, you’ll be in contact with a member from our Provisioning Department who will assist you in setting up your Internet Marketing Campaign for success. You’ll select your keywords and find out all of the ins and outs of your account but it won’t stop there…Even though you have access to our client dashboard 24 hours a day, 7 days a week, we believe in reaching out to our clients in a proactive manner and call each of our clients every 30 days to go over their account progress. This consultation is provided as a beneficial experience to you so that any questions that you have may be answered and explained. It’s important to us that you know the status of your account and know about all of the products and services that we’ve implemented to your internet marketing campaign.Whether it’s been 30 days or not, feel free to contact us at any and a representative will be happy to help you. We’re proud to announce that we now offer call tracking to our clients! 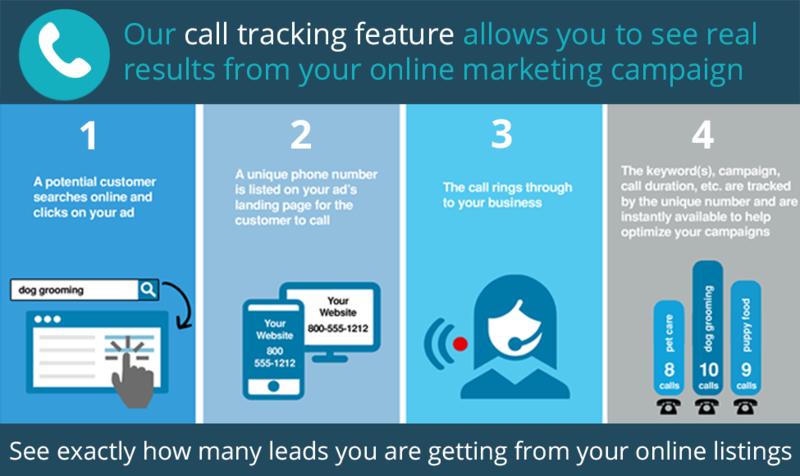 Call tracking is another great way to keep track of exactly how your internet marketing campaign with Internet Local Listings is performing. We’ll provide you with a different phone number that will reroute to your business phone number. Don’t worry! Your business phone line does not need to change and will not be altered so anyone of your existing customers that knows your number can still reach you! After that, we’ll place this number in all of your online listings and when people find your business online and call you, you’ll be notified via email (optional). This gives you a way to know that the caller found your business online through the listings that we created for you.We’re able to send you reports regarding the number of calls that you get from this number each month and can provide you with recordings of the phone calls (optional) at your command.Want to know more about call tracking and how simple it is to set up? Call a representative today and we’ll walk you through it. 45 days is less than 2 months and is also the amount of time that we guarantee we will get your business listing seen on the front page of Google – Better than any other guarantee in the industry by 2 weeks.We want to make it as simple as possible: See yourself for 2 or more of your keywords in less than two months, or don’t pay until you do.It may seem shocking that we’re able to promise such an aggressive guarantee but after months of research and test accounts, we’ve found the key to providing such great results to all of our clients. Organic Rankings give your listing the placement that it needs to succeed and that’s the direction that Internet Local Listings is branching out in.Your business is results-driven, and at Internet Local Listings, so are we. We stand by our work and are excited to share our marketing strategies for the benefit of our customers. As our internet advertising company continues to grow, we also vow to continue to research, test and develop new methods to help businesses – like yours – prosper. While each of our packages offer online branding, our Apex Package includes our exclusive branding package to further promote your business! 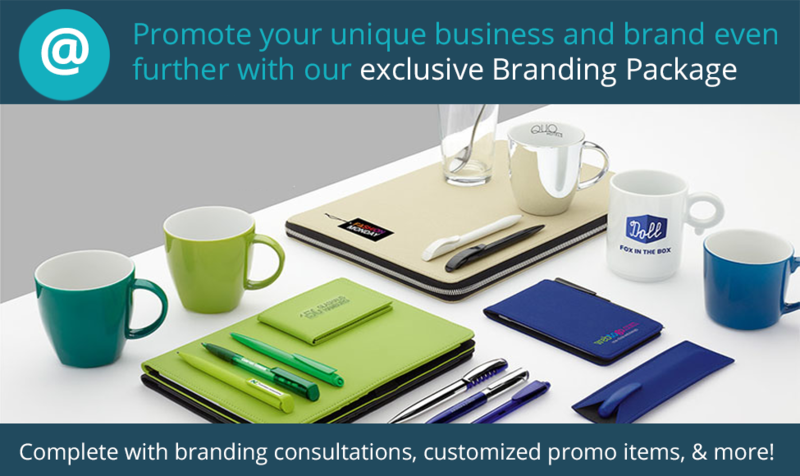 Complete with a branding consultation, a logo for your business, branded promotional items and personalized business emails, you’ll take the representation of your business to the next level. After deciding what type of logo you want for your business, one of our design experts will create 4 different logos for you to choose from. Once you’ve chosen your new business logo, we’ll send you a branding package that includes items like coffee mugs, business cards and more! We’ll even provide you with a digital file of your logo so that you can order more promotional branding items whenever you want to. We’ll also be setting you up with 5 branded email addresses so that you can reach out to your customers with professionalism in your name! Sending out emails to leads captured on your Premium Website from yourname@yourbusiness.com is sure to show your customers that you mean business.With everything added onto the Apex Package in our Premier Branding Package, you’ll have everything you need online and at your business to really promote the success and meaning of the business that you started.